For once Allie and I were actually on the receiving end of someone's move. With every major move we've made, many household items were either given away, or sold off cheaply. Most of these things were either deemed too large or no longer needed; stuff like lawnmowers, gardening tools and furniture. While we were sad to see our across-the-street neighbors pick up and move back to Florida after eleven months of California residency, it was very nice of them to present us with some of their propane-powered castoffs. First up was a nice patio set and outdoor fireplace. The neighbors were certain that it wouldn't fit in their U-Haul. I know of a certain dad who's going to spend plenty of time watching "caveman TV" when he visits later this summer. 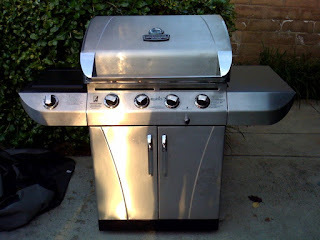 Second up was a less-than-a-year-old grill. Since I just bought a new grill last May, I don't need it. Offered to a few friends at work, but everyone is pretty much set - so after a thorough cleaning - onto Craigslist it goes.